There’s a lot of talk about whether one needs a scope mounting kit or not. If you have the necessary tools handy to mount your rifle scope then you certainly don’t need one. Otherwise, it’s a good investment to make as you will have all necessary tools available. Reading through forums you will find that there’s a lot of experienced shooters that think that a scope mounting kit is a waste of money. But, think of it for a minute. Most of them have purchased the necessary tools to mount a scope in the past and it’s therefore clear that they don’t need a kit. However, if you don’t have all you need or you want to make sure that you have all necessary tools in one place, then buying a scope mounting kit makes a lot of sense! Having that out of the way, which kit should you buy? They all seem similar yet different. We’re having a closer look at them so you can pick the best rifle scope mounting kit for you. When you take a closer look at the kits that are offered then you will see that there are two companies that have the lion’s share of the market. These are Wheeler and Weaver. It’s not surprising that they also have the best mounting kits you can get. Tools you use for mounting your rifle scope share one common treat with all other tools you have for various other activities. Cheap tools lack quality and break, don’t fit or work, etc. They are simply not worth the (low) amount you spent on them. You rather want to buy less, yet high-quality tools instead of cheap ones that break the first or second time you use them. Every set of rings has slightly different specifications on how much torque per screw is needed. If you overtighten the rings you can damage your scope (or the rings). You want reliable mounting tools that have accurate torque settings so you won’t damage any component while making sure that everything stays in place! Getting high-quality tools does not mean you have to rob a bank. If you’re not mounting and re-mounting scopes on a daily basis then there’s no need to get the premium line of tools. Middle-of-the-road tools that have a good quality will be sufficient and will save you some money. What kind of kit to get? Depending on your needs and how often you will mount/remount your scope(s) will impact the choice of which kind of kit to get. It will also depend on what tools you already have. If you own not tools yet then getting a full mounting kit makes the most sense. These contain all tools to mount and adjust your scope onto your firearm. If you already have a solid selection of tools then you might only be looking at getting a torque wrench, a bit set or set of screwdrivers. Or, you might just be looking for a lapping kit to work on your scope rings. The Wheeler Scope Mounting Kit Combo is the go-to kit when you need a set of tools to mount a scope to your rifle. Whether you want to mount your scope or need to adjust the mount, you find all necessary tools in this kit. ​Click here now to check current pricing and availability on Amazon! 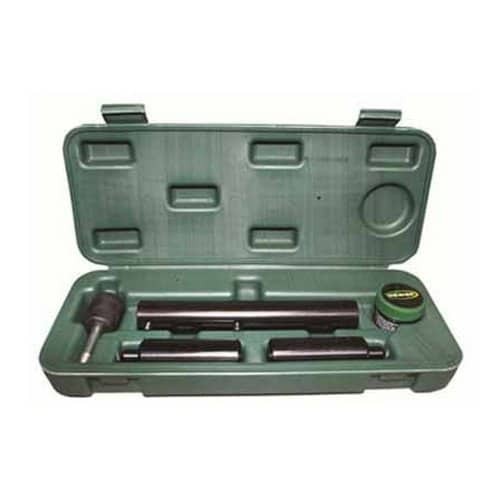 This kit is designed to work with one inch and 30 mm scope rings. It has matching lapping bars for either diameter. Many other kits you can find on the market will either work with 1 inch or thirty millimeter rings. This makes sure that the kit will last you for a long time even if you switch scopes over time. In case that you’re wondering why you might need a lapping bar, it’s quite simple. Many rings are not as round as you’d think they are. You might end up with one ring having nearly full contact all around while other rings can have a much lower contact area, even down into the 20 percent range. At that moment your scope will not be mounted as sturdy as it could and actually might shift. A lapping bar allows you to lap the rings until you can maximize the contact area. This way you end up with a much more solid mount with little or no risk of your scope shifting. The kit comes with a lapping bar and a handle. The handle unfortunately is a little on the small side and the shape doesn’t help when trying to get a good grip. This kit in addition contains four bars with pointed ends. These bars are intended to be used to verify that the lapping you’ve done on the rings is sufficient. You mount the rings in the bars with the pointed ends facing each other. When the points match then you achieved good contact from the rings and are good to go and mount your scope. This way you can make sure that you’re not accidentally damage your scope when the rings don’t provide good contact. 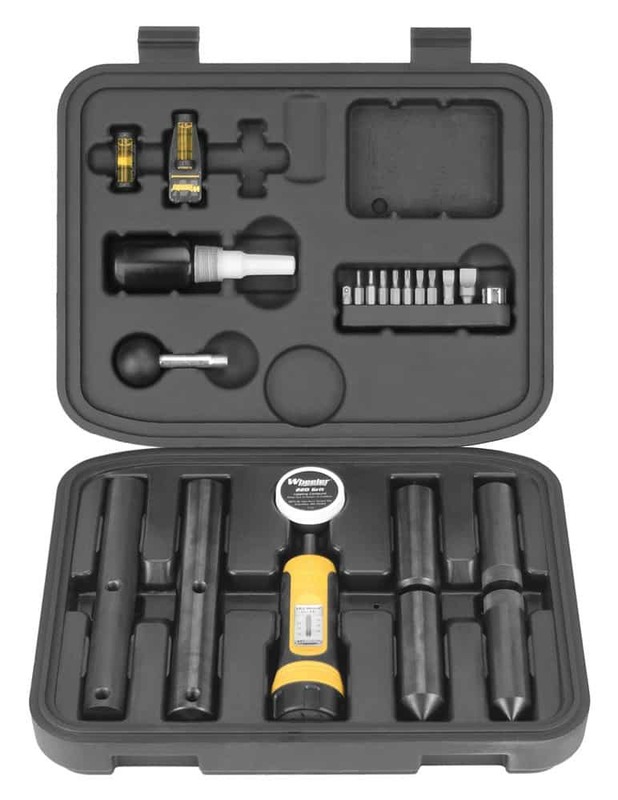 All tools are made from high-quality materials and they come in a plastic case. 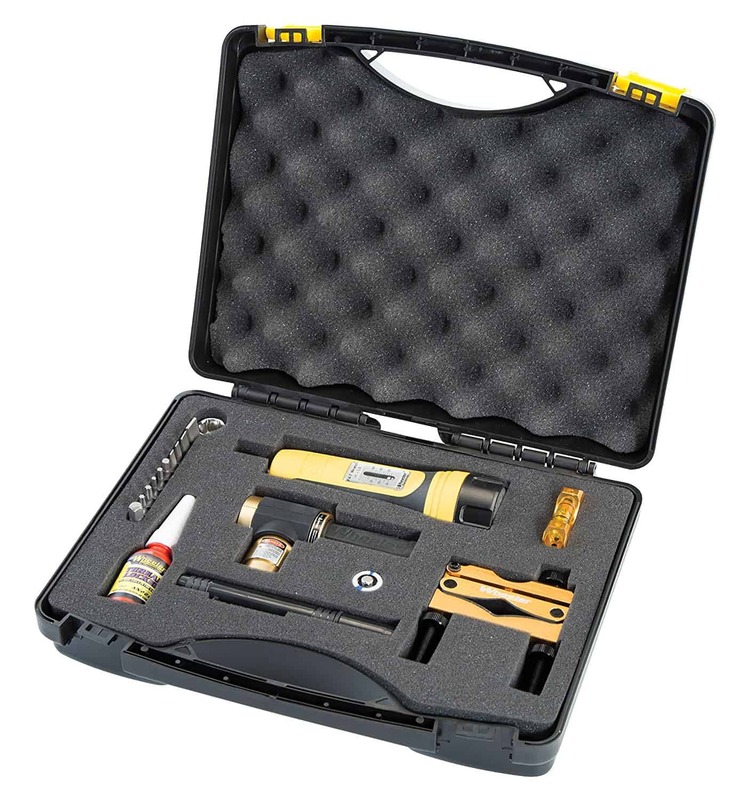 The case has specific compartments for each tool and a handle to carry it. 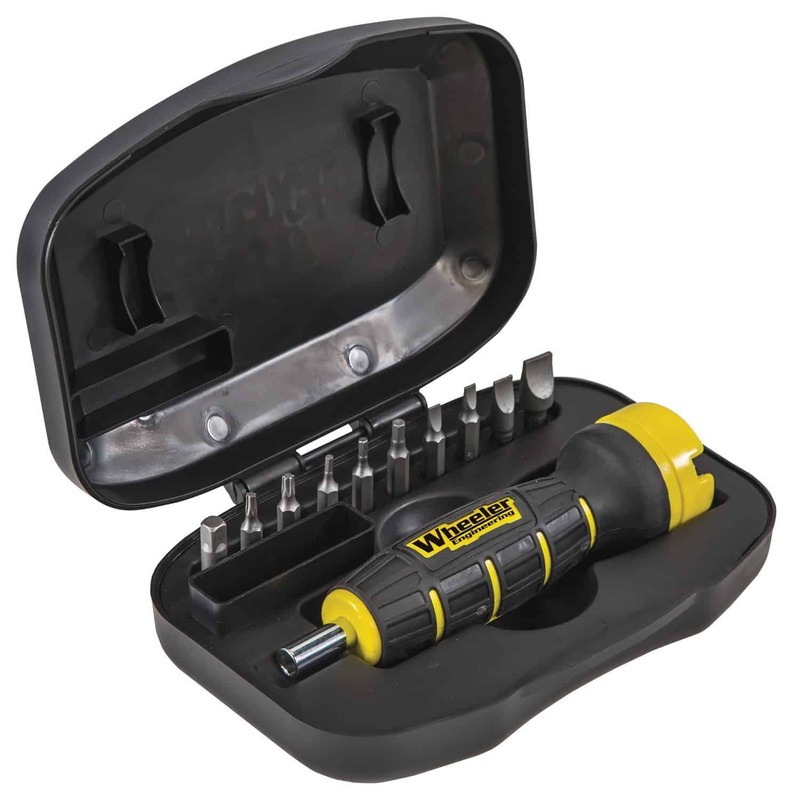 This allows all tools to stay in one place where you find them when you need them! This is the best scope mounting kit you can get. It has all the necessary tools at a great quality. It especially is by far the best if you have both one inch and 30mm scopes as it works for both. This kit will work well if you don’t have tools otherwise. Weaver also has a mounting kit that comes with lap tools. It contains all necessary tools you could need to mount a scope. In difference to the Wheeler kit, it only comes with lap tools for 1 inch scopes and rings. If you own a 30mm scope then you need to purchase the lapping bars separately. 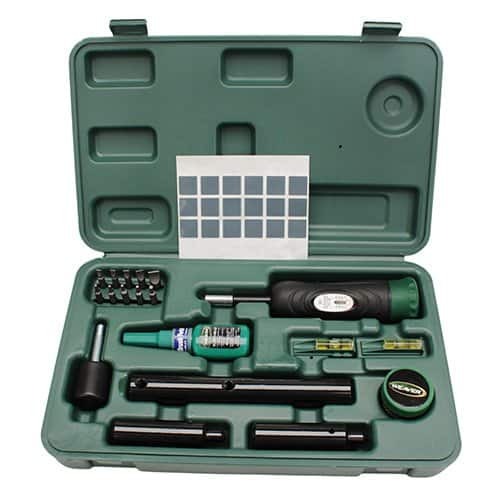 If you only use 1” scopes then you’ll be fine with the tools supplied in this kit. The quality of the tools is at least as high as it is in the Wheeler kit. You will not be disappointed. If the Weaver kit would come with both the 1” and 30mm lapping bars and alignment bars. On a positive note, the handle of the lapping bar on the Weaver kit is larger and better shaped. Especially if you have a somewhat larger hand you’ll be glad to have this design vs. the small round handle in the Wheeler kit! If the Weaver kit would have the matching lap bar and alignment bars for the 30mm scopes then it would have been our best pick. We like the case of the Weaver kit better as it’s more sturdy and seems to be somewhat better thought through. There are other kits available for purchase. Namely the Wheeler Ultra Scope Mounting Kit. It’s a more expensive kit with a different set of tools. There’s for example no lapping tools in this kit but it has a laser bore sighter as well as the professional reticle leveling system. These tools make up for more than the missing lapping bars as they push the mounting kit to a whole different level. As to be expected, you also will have to pay quite a bit more for such a premium kit. This equipment will allow superior mounting and sighting. While there’s no lapping tools, the rest of the tools makes up for that. The following tools are usually not part of a kit but are standalone tools that can help you make your mounting job easier and more accurate. 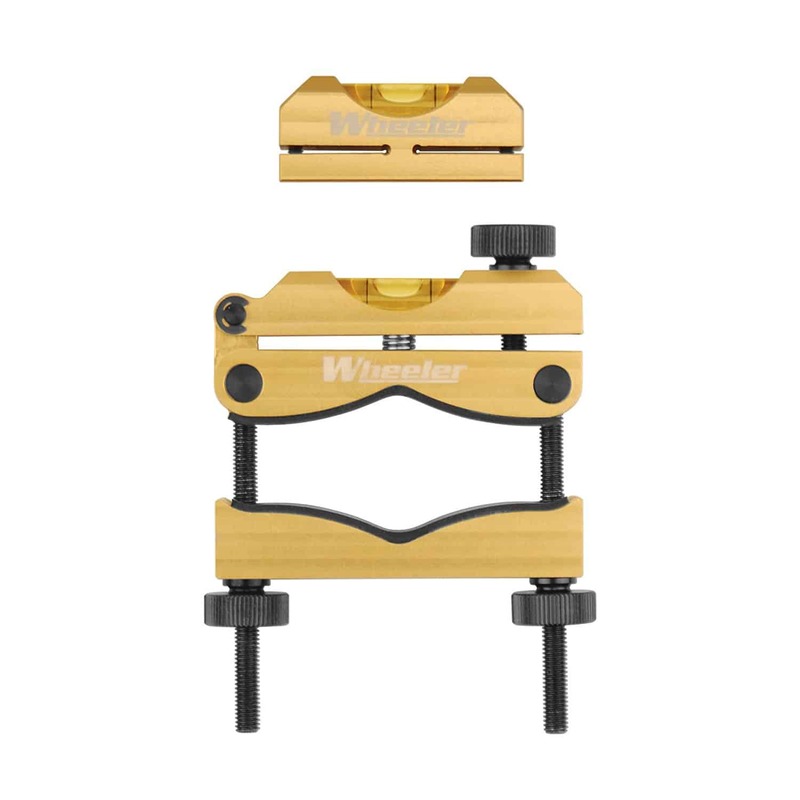 If you’re trying to get a perfect level for your mount then you will have to get a professional leveling kit like the one from Wheeler. This tool is cut from a solid block of aluminum. This makes it sturdy and very precise. It’s very easy to use as you only have to clamp it over the barrel close to the stock. The other level goes over the top of the rifle’s action. When both are matched you tighten the screws. Now you mount the scope and then place the level from the action on top of the elevation turret. This allows you to perfectly level the scope on your rifle. You can find other tips and tricks on how to mount a scope and to make sure that it is level. Many experienced hunters and shooters have their own methods but using a professional level kit will simply make things a lot easier, more precise and faster. This is a great set of lap tools for 30mm scopes. It makes it easy to improve the fit of your rings on your scope as it increases the friction between those two items. The kit includes a professional lapping bar made of high-end steel. In addition there are two alignment pins and a handle for the lapping bar. The handle is nicely sized and makes it easy to use the lapping bar. All of these tools come in a durable carrying case. It’s easy to store all tools that way or take them with you. If you don’t have a set of lapping tools then this is the one to get. It’s high quality and will make it easy to use to improve the friction between the rings and the scope to get a perfect mount. If you don’t have any other tools when mounting a scope on your rifle then the one tool you definitely need is a torque wrench. This specific wrench is pretty much the standard for torque wrenches. The unique feature of this wrench is that you set the amount of torque through a digital setting. This allows to specify and set the exact torque settings you want. It can be a little harder to dial in the exact poundage you want with an analog wrench. It’s also easy to use this digital wrench to verify torque settings. You can read the current poundage when you use it on a screw. It’s an easy way to make adjustments or to verify that a screw is tight. Is a laser bore sighter a necessity when sighting your rifle? No, it’s not. It’s kind of a luxury. Yet, it has one huge advantage. Using a laser bore sighter will help you to reduce the ammunition you need to sight your rifle tremendously. You use the laser of the bore sighter to align your rifle and scope and zero in. This bore sighter has the laser mounted at the end of the rifle. This makes it flexible to use with any pretty much any rifle. The laser can be used for distances up to 100 yards. Setting up your scope with the bore sighter will get you within a few clicks of zeroing the scope in. If you’re not an experienced rifle scope mounter then getting a kit to have a good set of tools is essential. In our opinion, the best kit is the Wheeler Scope Mounting Combo Kit. It has a full set of tools you need to get your scope mounted. You might consider to get a better leveling system compared to the one you have in the kit. Getting the Wheeler Professional Leveling Kit will help a lot with finding the perfect level. The included levels in the mounting kit are sufficient yet not as good as the ones you get in the leveling kit! Get the right tools to mount your scope and see how easy it can be!